When North Korea agreed to send athletes to the Winter Games in Pyeongchang, South Korea, next month, it was hailed as an amazing diplomatic breakthrough. But that inspiring mood of unity and goodwill has just been shattered to bits: Leaked plans from the North Korean weapons program revealed that an Olympic gold medal is the last component it needs to complete its nuclear ICBM. The fate of the world hangs in the balance. If a North Korean athlete wins gold this year, nothing will prevent Kim Jong-un from being able to destroy any city in North America. 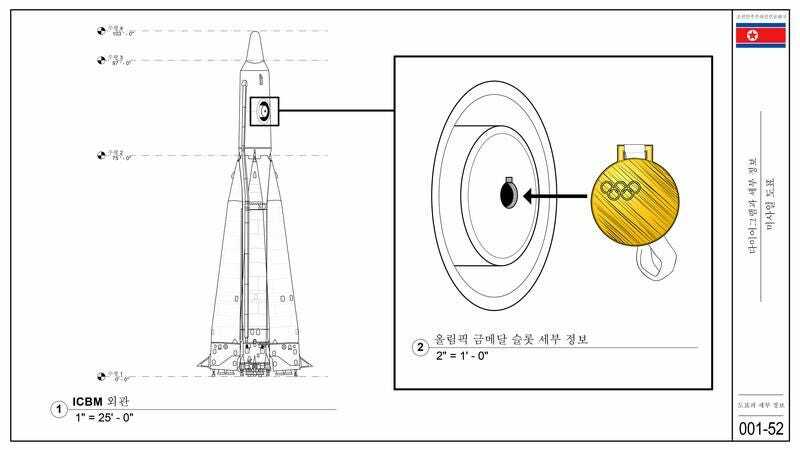 According to a CIA analysis of the intercepted blueprints, the prototype Hwasong intercontinental missile is only capable of flight when an Olympic gold medal is inserted into a disc-shaped slot within the rocket’s inner propulsion mechanism. North Korean athletes have been training for years to perfect their figure skating, ski jumping, and bobsledding skills in order to obtain the vital metal circle that is the exact size, weight, and purity their military needs to unleash nuclear Armageddon. Once this final piece is added, the missile will be able to strike targets as far as 10,000 miles away, enough to strike even Washington, D.C. The only small sliver of good news is that the apparent design of the ICBM requires a Pyeongchang 2018 gold medal. Inserting a silver or bronze medal into the inner sanctum of the missile circuitry will cause the weapon to detonate immediately on the launchpad. The Winter Olympics should represent peaceful competition and good sportsmanship among all nations, but now the entire world will be watching with terror every time a North Korean figure skater winds up for a triple lutz, praying they won’t stick the landing with grace. We can only hope that other countries win all the gold medals, or the entire world will be vulnerable to a nuclear-armed Olympic champion North Korea.